Consuming high quantities of glucosinolates can suppress the function of the thyroid, resulting in goiters. This toxic substance can be found in trace amounts in canola oil. The amount of oil required to cause thyroid damage and toxicity are well beyond normal use of cooking oils. 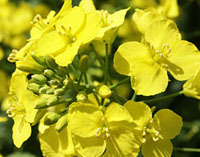 Canola produces 40 percent oil from each plant. Research studies determine that of the 40 percent oil base, glucosinolates account for less than 1 percent of the hybrid canola plant. Concerns regarding the use and consumption of canola oil are no longer valid. Neither humans nor animals should use this product as a primary food source. Additionally, even the small amounts of glucosinolates in the canola plant reside in a separate pouch in the plant. During processing the pouch is removed to avoid contamination. Only when the pods are damaged does erucic acid get into the potential food source. All damage seedpods are used as animal feed supplement or mixed into bio fuels. With a plethora of available research on the efficacy, safety and ingestion of canola oil, this hybrid plant is the key to a healthy eating. The selectively bred canola oil plant is also in tune with the environment, both safe to the soil and surrounding environments in which these helpful plants grow. Canola even mixes as carrier oil for bath salts, scrubs and bath oils. It is gentle to the skin and the small amounts of oil absorbed through the skin provide omega fatty acids. Concerns about ingesting erucic acid and its toxic components were addressed by the USDA. It was determined that the levels of erucic acid found in consumer canola oil were within the limits of safe consumption. With all types of fats and cooking oils, use in moderation is a benefit to the body. Excessive ingestion of fried foods and baked goods can increase the levels of fat stores in the body, which could be said of many products that contain fat. This substance in butter, oleo, bacon grease and margarine enhances the flavor of foods, which can lead to overindulgence. The concerns regarding rapeseed oil as a consumable product were addressed in 1968 when Dr. Baldur Stefansson selectively bred rapeseed to reduce its erucic acid. At the University of Manitoba, Dr Stefansson also reduced harmful levels of glucosinolates. He renamed the new plant Canola from Canadian Oil that was low in acid. As early as 1936, rapeseed oil was manufactured as a fuel and lubricant for the early automobile industry as well as steam engine and marine motor engines. Rapeseed oil is known to attract bees, as the oil of the plant is a major source of nectar for honeybees. To manage this issue, the United States prohibits rapeseed oil plant growth in areas where pollination is vital to plant survival, as is the case with crops specially grown in the U.S. such as carrots. Additionally, rapeseed oil is not used as a consumable plant as its cousin the canola plant but was genetically engineered to maintain reduced levels of erucic acid and the controversial glucosinolates as a biofuel. Replacing rapeseed oil as a bio fuel and lubricant in the United States would reduce the risk of oil spills from offshore drilling. Damage to the wild Alaskan tundra and the wetlands of Gulf Coast would be significantly reduced by growing rapeseed oil plants and canola oil plants. The genetically modified rapeseed oil has not been found to be detrimental to the environment even when grown with other plant crops. JIF peanut butter, could this have harmed my grandson who insists on PMJ sandwiches daily?